Testimonials « J.J. Maxwell Tack & Saddle Co. J.J. Maxwell Tack & Saddle Co. I have been riding my four year old Mustang, Tyr, in an Ortho-Flex Versatile saddle, and have been looking for a suitable western saddle for some time. A previous attempt resulted in my buying an ill-fitting western trail saddle by Weaver, that interfered with his shoulder movement, and has been for sale since its fourth use. In April, I ordered a J.J. Maxwell, Wade Trail Saddle, with saddle bags and pommel bags, and received it one week ago. Believe me, it was worth the wait. I continue every day to be impressed with the workmanship and fit of this saddle. From the very first time I put it on my horse his movement and willingness improved immensely. For the first time, he has complete freedom to use his back and shoulders properly. It is the most comfortable and best designed saddle I have ridden. Until now “balance seat” has been an expression rather than a feeling. Your saddle epitomizes the reality. After three rides of about one hour each, I felt completely comfortable taking Tyr on a four day trail camp-out with this saddle. The attached photos will give you an idea of the terrain over which we rode. The highlight was a six hour ride that rose about 1500 feet over extremely rugged terrain, through bush, on trails that were often non-existent. Negotiating slopes of 50% or more requires a horse to have complete freedom of movement of his shoulders and hindquarters, and the J.J. Maxwell modified tree does that splendidly. 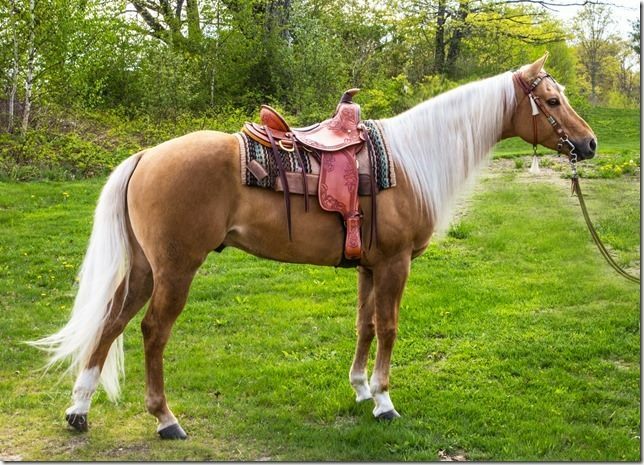 My advice to anyone contemplating the purchase of a new trail saddle would be to immediately buy a J.J. Maxwell saddle, and avoid the expense and heartache of getting it wrong. Thank you Cindy and Joe for your service, your good humour, and above all your ability to build a truly superior saddle. Please feel free to use this letter to promote your products. I wanted to thank you for getting my saddle out to me in time for hunting season. I used it on my mule in Nevada, Idaho and California. This mule has always had a problem going down hill. She would turn sideways, throw her head and balk. I have always gotten off and walked down hill with her (she is eight.) A friend told me about you and loaned me one of your saddles; it made a new mule out of her. She traveled just as free going downhill as up, no more head tossing or turning sideways and she really stepped out. I ordered my own and after using it all Fall in three states the results are still the same; no more problems. She is a 1000% mule but the draft mule bars fit her (and my other riding mules) real good. I have tried countless saddle and pad combinations over the years trying to fix her up but the best I could come up with would allow me to LEAD her down hill without her turning sideways but she still tossed her head a lot. So I thank you very much for helping out my poor critter. I can’t thank you enough for the beautiful, functional, and incredible saddle you built for my daughter’s mule, Sineadh. We had disappointedly gone thru 3-4 saddles including one’s that claimed they were “mule saddles,” and saddles that took a mold of Sineadh’s back before we chanced upon you at the equine affaire. My daughter had brought her mule up to be the demo mule so it was the perfect time to find the right saddle. Joe was kind enough to come out to the stalls to personally fit a tree to Sineadh. What was remarkable was that the paso fino tree fit the best! 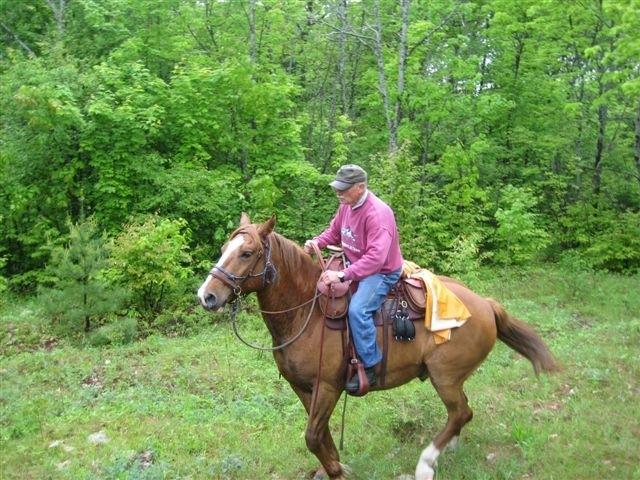 Joe had the saddle and breast collar ready for the first ride of the season (less than 4 weeks from when we ordered it). My daughter rides competitive trail with NATRC (35-50 mile rides) so if the saddle isn’t right she knows it. The saddle was not only perfect it got admiring glances from everyone that saw it (Hope tooling). My daughter also likes the placement of the stirrups which facillitates a more centered seat. Mules are like horses, one tree does not work for all. Joe has come up with a nice and easy system of trying a variety of trees on to find the right match. My daughter is already begging for the new Wade type saddle although I think she’ll have to pay for that one!! I am primarily an English rider with a background in a pony club and combined training. The young Arabian I have now seems to enjoy working with cattle and has gaits typical of a western pleasure horse. 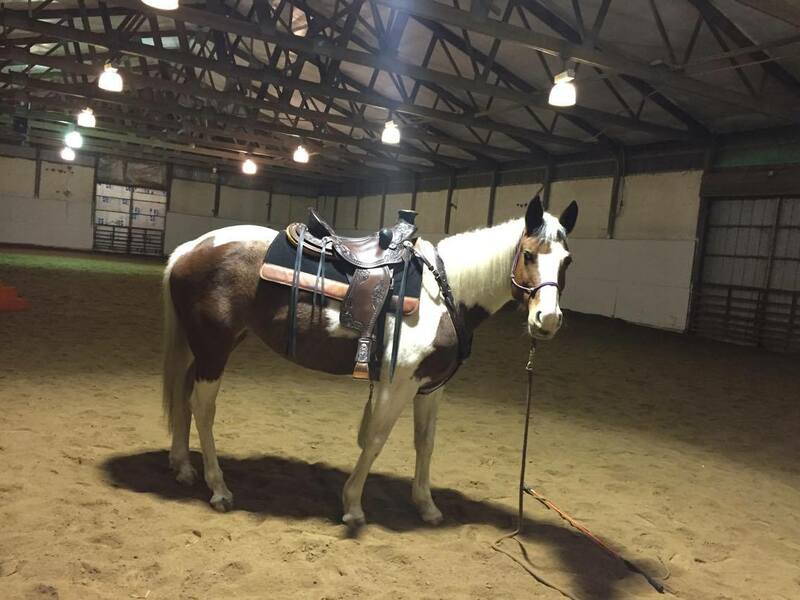 I’ve always wanted a good western saddle and not only did I feel that my short-backed Arab had special needs, but I did not want to sacrifice the balanced seat position I am used to in English riding. I couldn’t find a suitable “off-the-rack” saddle that would fit my needs, so I began shopping for a custom made saddle by checking out what people were using and by asking around. 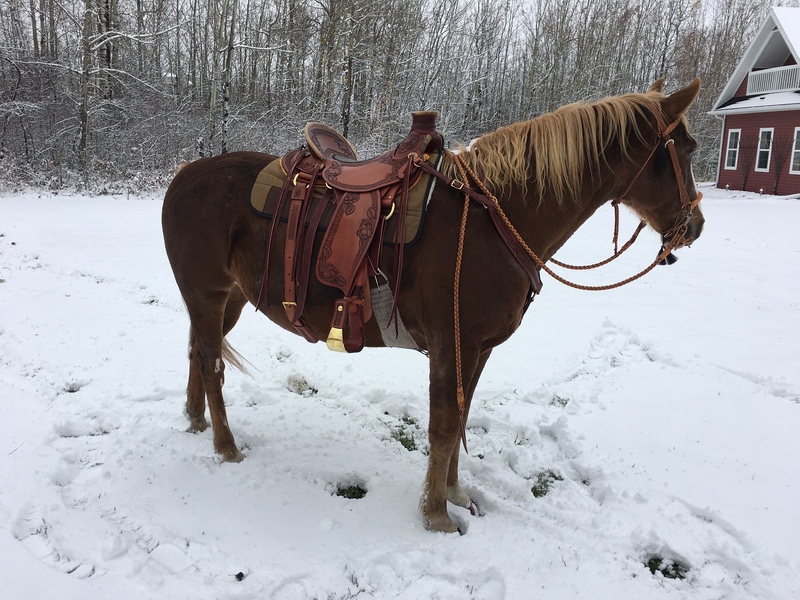 Two friends were riding JJ Maxwell saddles and both had purchased theirs for reasons similar to mine in that they wanted a saddle that would fit behind the shoulders and which would promote a balanced riding position. Perhaps the most difficult part of purchasing a JJ Maxwell custom saddle is the multitude of choices you have in creating the saddle of your dreams. Design, rigging, color, tooling, accessories – thank goodness Cindy and Joe didn’t seem too perplexed when I changed my mind a couple of times. The fitting of the tree by using the video and forms they sent, turned out to be the easy part. I finally selected a western saddle with Hope rigging and the saddles only took a couple of months to create. I have to say that I was thrilled and had tears in my eyes when I opened the box. The saddle was much more beautiful than I had imagined. Better yet, was the fit. My little Arab, Cam, is notorious for being sensitive and picky about tack. When I put the first few miles on him in my English equipment, he would get itchy, crank his tail angrily and even reach around and bite the saddle. 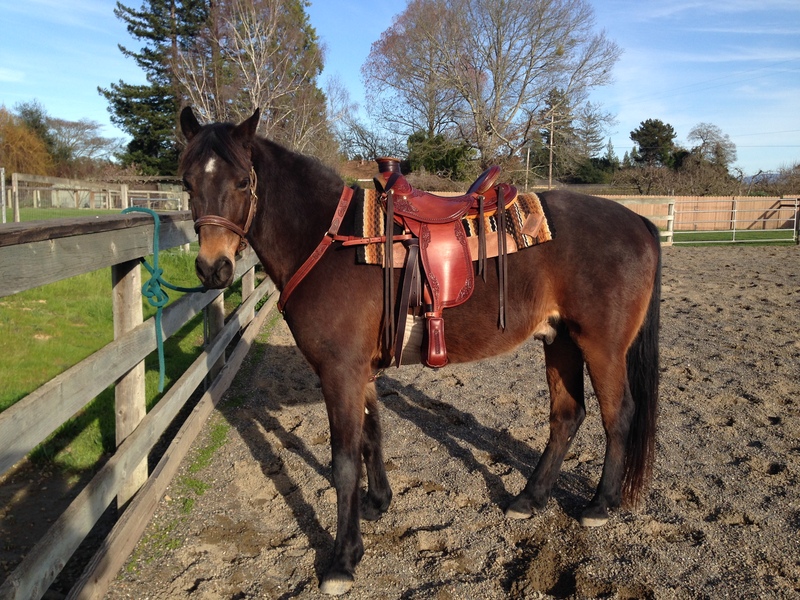 It took months of “wearing” my English saddle for him to finally get used to it. I was quite concerned that he might not accept a western style saddle at all. Much to my surprise and relief, he took to his new JJ Maxwell saddle immediately. He has never exhibited any behavior that would indicate a concern with the saddle or rigging. 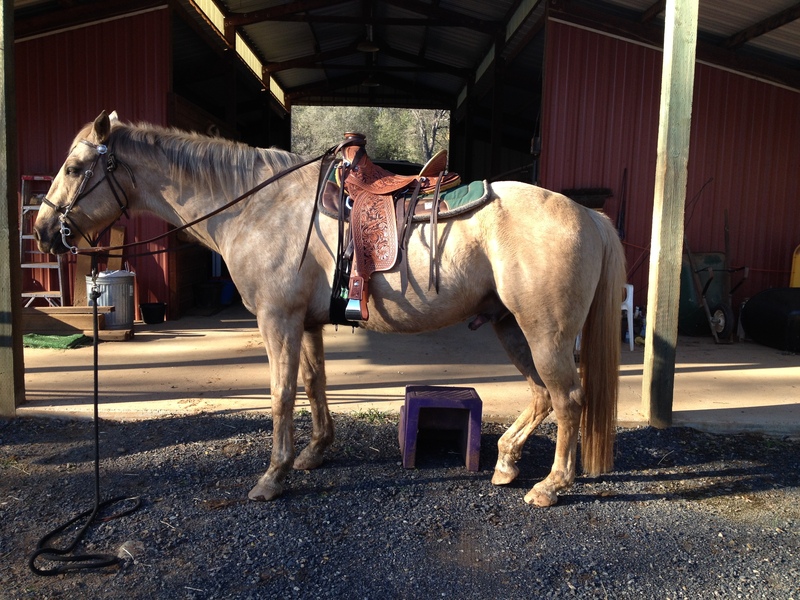 I’ve had him up and down the trails here in the Sierra Nevada foothills and he has participated in beginning cattle events wearing his saddle for most of the day, never once showing any signs of itching, discomfort, or irritation. The saddle remains nicely positioned behind Cam’s shoulders with the Hope rigging and when I remove it, there are absolutely no dry spots and no signs of soreness or rubbing anywhere. Lately Cam has been helping me pony my young filly and the saddle has remained comfortable and secure throughout the plunging and bumping that goes along with bringing along youngsters. The fit for me personally, is excellent. I have the good balanced seat position that I expected and find the saddle very comfortable. The stirrups are easily adjusted and the fenders turned to a perfect position for getting on and riding comfortably the first time out. Needless to say, I am elated with the appearance and comfort of this saddle for both me and my horse. I highly recommend purchasing a JJ Maxwell custom saddle. It is as much exquisite work of art as it is an essential piece of working horse equipment. Should I not be able to ride for whatever reason, I’ll just bring that gorgeous saddle into my living room and enjoy just looking at it. Cindy and Joe, I am just so pleased with the new saddle, it’s amazing! Fits Chex to a “T”, and he has shown much more freedom of movement in his shoulder and back. Finally! After trying SO many different saddles on him! It fits me as well, reminding me of my favorite dressage saddle, (only better…more secure). This is the first western saddle EVER to accommodate my short frame and legs!! I love that my legs just fall naturally under me in a balanced position. And of course, it’s drop dead gorgeous to boot. I am pleased with virtually every aspect of this wonderful, lifetime saddle. 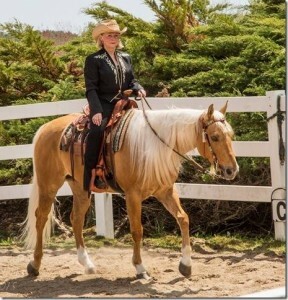 Can’t wait to start our Western Dressage classes! I just can’t thank you enough, and Chex thanks you for his comfort, too. I can’t say enough how happy I am with the saddle 🙂 I only went out for 30 mins but once the saddle was in place it never moved and this is the first time I haven’t had to have the cinch super tight!! The fit is perfect!! Amazingly comfortable, extremely balanced and looks to boot!!! I am so excited to show my saddle off to everyone!! I have been getting so much good feedback on it already!!! I wouldn’t hesitate to order another saddle 🙂 thank you for making this beautiful saddle!!! !